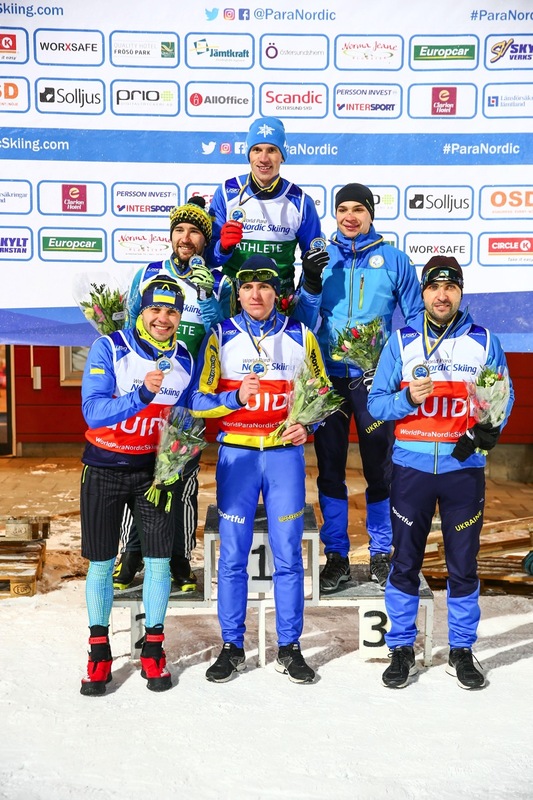 The Ukrainian team dominated the biathlon sprint races in Ostersund winning 10 medals from a possible 18 on offer on day three of the World Cup. In the women’s standing and the men’s vision impaired races they swept the podiums with an impressive display of biathlon skills. Oleksandra Kononova led the Ukrainian charge in the women’s standing. Although she missed two shots she managed to finish ahead of her teammates Liudmyla Liashenko in second and Bohdana Konashuk in third. Kononova has not lost a biathlon race this season. The second Ukrainian clean sweep was led by Iaroslav Reshetynskyi and guide Kostiantyn Yaremenko in the men’s vision impaired. He finished ahead of teammates Anatolii Kovalevskyi and guide Oleksandr Mukshyn in second and Oleksandr Kazik and guide Sergiy Kucheryaviy in third. Like Kononova, USA’s Kendall Gretsch remains unbeaten in biathlon this season after winning the women’s sitting race in Ostersund. She was perfect on the range beating teammate Oksana Masters into second. Masters missed two targets which put the victory out of her reach today. Germany’s Andrea Eskau had one miss in third place. Daniel Cnossen continued his outstanding season winning the men’s sitting. He has won all three races in Ostersund so far and there is a good chance he could win the remaining two. He was pushed hard though by compatriot Aaron Pike. Both US skiers missed one shot on the range and that proved costly for Pike as a clean shoot could have won him the gold. Ukraine’s Taras Rad returned from illness to take the bronze medal. The Paralympic champion in this event Benjamin Daviet took the gold medal in the men’s standing. Despite one miss the Frenchman still finished ahead of the rest. Ukraine took the silver medal with some great shooting from Gregorii Vovchynski who hit all ten targets as did Germany’s Alexander Ehler in third. The World Cup leader Nils-Erik Ulset of Norway had a bad day on the range missing three shots to finish fourth. Germany’s Clara Klug followed up her two wins in biathlon from the first World Cup in Finland with another in Ostersund in the women’s vision impaired. She shot clean to finish ahead of her main rival Ukraine’s Oksana Shyshkova and guide Vitalii Kazakov. Third place went to another Ukrainian Andriana Kapustei and guide Nazar Stefurak. That result means Klug and guide Martin Hartl extend their lead in the biathlon World Cup standings. It was triple profit for Ukraine in the vision impaired for men. The winner was Iaroslav Reshetynskyi. In second place, 1o seconds after was Anatolii Kovalevskyi and in third place Oleksandr Kazik. The cross-country sprint is the next event in Ostersund on Wednesday 16 January, and you can watch it live on World Para Nordic Skiing’s website, where live results are also available.